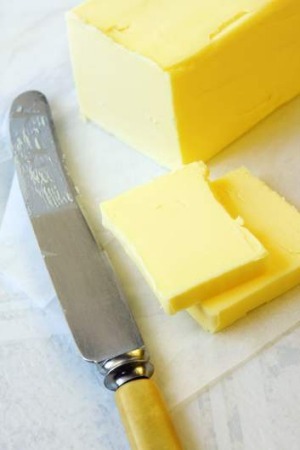 I have a mate well versed in all matters dairy who, for some reason, wanted to make his own butter and call it ''Last Tango'' butter. Why you'd want to mix butter and Latin dancing is beyond me. He suggests using pure cream, as whipping cream has added gelatin that sullies the flavour. Now whip it. Whip it good. Whip it well past being fluffy and until the fat has separated from the liquid. Take this mix and place it in a sieve and drain away the buttermilk. Use the buttermilk for baking. Rinse the butter under cold running water. Return to the bowl and churn it a little more and drain and dispose of any liquid. Add salt to taste, mix and form into a block, wrap and chill. Resting meat allows the muscles to reabsorb the liquid expelled during cooking. Resting a stir-fry would mean your meal would go cold. With stir-frying, the secret to tender meat is to make sure it is well trimmed and finely sliced. I see the recipe you attached specifies rump steak. This is actually a group of different muscles with some connective tissue. It is more flavoursome but does need to be trimmed. Try using topside and slicing it yourself. Gelatin is made from animal skin, mostly pig. It is often extracted using acid. The first extraction produces the clearest, cleanest and firmest-setting gelatin. Further extractions produce gelatin that is not as clear and can be meaty tasting. Sheet gelatin is preferred by some chefs and pastry cooks as it makes a clearer and cleaner-tasting gel than powdered gelatin. The gel strength of gelatin is graded with a ''Bloom rating'' - the higher the number, the greater the strength of the gel. Gold leaf gelatin has a Bloom rating of 200 while titanium leaf gelatin has a Bloom rating of 250. Weaker leaves weigh more than stronger leaves. This means that the weaker leaves still have the same setting power - which means you only have to count the sheets, not weigh them. The texture and clarity, will differ, however. One sheet of gold gelatin is equivalent to 2.2 grams of powdered gelatin and a titanium sheet equals 5 grams of powdered gelatin. Soak sheets in water under 21 degrees for a minute to hydrate them evenly before dissolving in warm liquid to avoid lumps. Geese lay their eggs in spring. They raise their goslings over summer and then, like many of us, gorge before the onset of winter, piling on layers of fat. In Europe, geese were harvested at the end of autumn for their fat, which was traditionally used in cooking, particularly baking, as well as preserving. Some geese were held over and fattened further for a Christmas meal. In Australia, a real, fresh Christmas goose will be a young bird. Some larger birds sold as goose are actually muscovy ducks. You can find mature, fat, frozen geese that are more the real deal. Try Feather and Bone in Marrickville, NSW, on 02 9818 2717 or John Cesters Poultry at the Prahran Market, Melbourne, on 03 9827 6111. J. Swanson writes, ''In reference to the article on chorizo recently, may I recommend the chorizos made by the Rodriguez Brothers at Yagoona, NSW?'' You may. I agree. Their website: rodriguezbros.com.au.